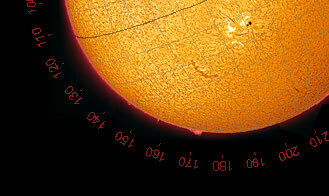 TiltingSun-G is a special graphics tool to overlay the disk orientation and latitude-longitude grid onto images. You can generate an oriented graphic and transfer it to PhotoShop or other graphics programs. Disk size in pixels can be specified. All colours can be chosen. The grid interval and other parameters can be specified. 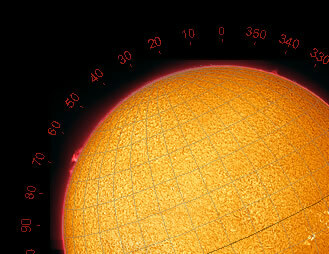 The solar image was taken by Peter Lawrence (site).